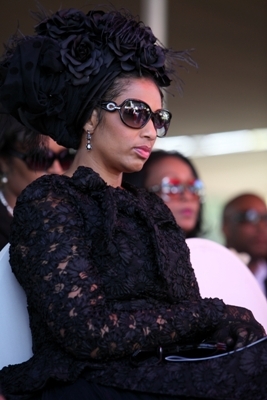 A week after Vuyo Mbuli’s funeral his wife Savita has raised eyebrows with a “party” held at her house. HARDLY 10 days after the TV and radio icon Vuyo Mbuli was laid to rest, there was a party at his house. His death and funeral have been surrounded by a series of scandals and rumours since his tragic passing on 18 May. And even after his burial gossip continues to plague his memory. This has left many people shocked as traditionally the Mbuli family – specifically his wife – is supposed to be in mourning. Traditionally the weekend after a funeral is supposed to be for umsebenzi wokuhlamba imihlakulo (the cleansing of spades), which is done by the deceased’s family. Yet family friends of Vuyo and Savita were shocked to discover that Savita had invited her friends over to perform this sacred ceremony and also to celebrate her best friend’s “pre-50th birthday”. According to the invitations, before Vuyo’s untimely passing Savita was in the process of organising a pre-50th birthday party for her friend, known to DRUM only as Shumi. The party was initially going to be held at Hartbeespoort Dam from Friday 31 May to Sunday 2 June. After the initial and indefinite postponement, the party was then re-routed to the Mbuli’s home in Houghton. DRUM was alerted on Friday 31 May after eyebrows were raised at the sight of several flashy cars turning into the late Vuyo’s house. Sources who were among the guests that night revealed to DRUM that it was Shumi’s “pre-birthday party”.